Pebble was a relatively new player in the game last year at CES 2013, but this year they return as a established smartwatch manufacturer, and they had a big announcement for CES 2014. The successful kickstarter company unveiled its next generation of watch called the Pebble Steel with an all new and updated designed face, new 2.0 software, and stylish bands. 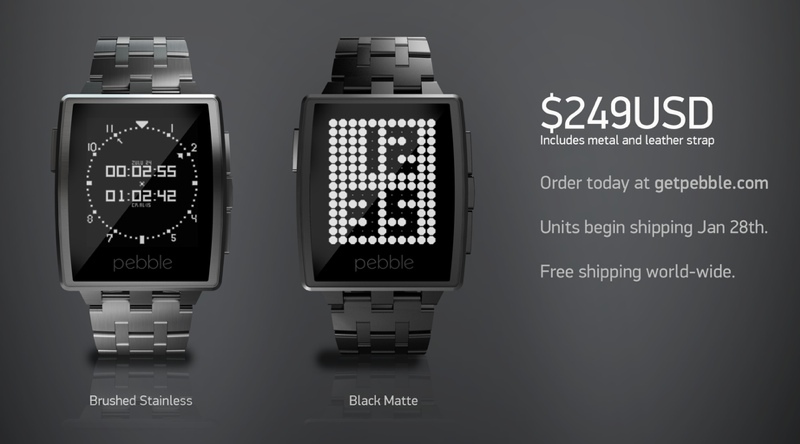 The new Pebble Steel features a stainless steel body with a leather or steel band. The facia is still Gorilla Glass, but the whole profile of the new Pebble Steel is lighter and thinner. The whole new design leaves behind the ‘try hard’ design of the previous model which tended to look like it was trying to be a future tech accessory. Now, the Steel looks more of a traditional watch and something which wouldn’t look too out of place in a watch shop, in part thanks to the updated bands. The band is available in the brushed stainless steel, but also comes in a matte black steel and black leather option. The Steel retains the same software as seen on the previous smartwatch in order to prevent fragmentation, but reaches the 2.0 version bringing added functionality and speed improvements. The battery is said to last a week on a single charge, and there’s an LED indicator showing how much juice is left. Similar to the previous model, the Pebble Steel is waterproof. Shipping will be available on January 28th for $249 and is available for pre-order today.